Last month we heard that the House was passing a farm bill that didn’t include a nutrition title – effectively leaving the millions of people who depend on food assistance in their times of need out in the cold. And now, as reported here yesterday, House leaders proposed a separate Supplemental Nutrition Assistance Program (SNAP) bill – one with ten times the cuts that the Senate proposed last month. NYFC put out a call to action, and hundreds of farmers have stood up in support of SNAP. Have you signed up yet? As farmers, we know that everyone involved in the food system needs to be represented at the bargaining table. Our legislators have a duty to take a stand against partisan bickering and make sure all of their constituents have a voice – both the producers and the consumers. It is thrilling to see the waves of support for SNAP after the House’s bill was announced. Now let’s keep that energy rolling! Have you already taken action? Then share your story with the NYFC community! We are showing the entire country a way to move ahead: a united front pushing for strong communities and a brighter, farm-friendly future. 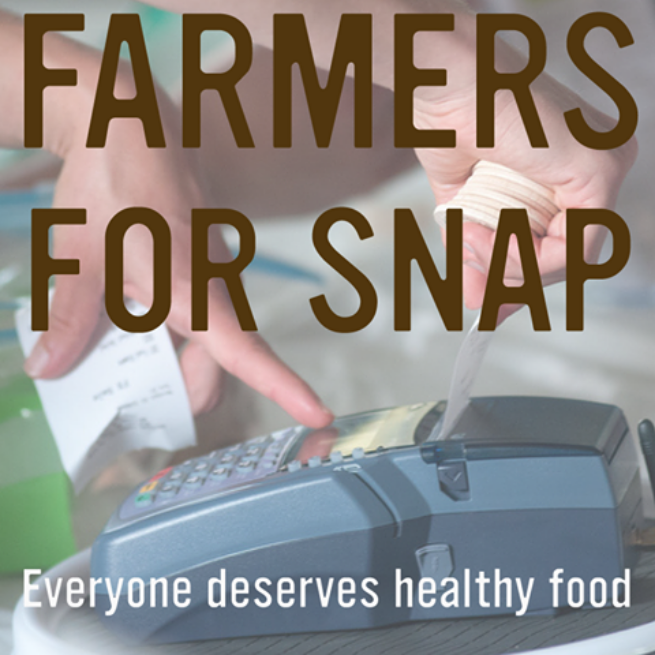 Send us a quick email (actions@youngfarmers.org) to let us know why SNAP is important to you or your farm. Does your farmers market accept SNAP benefits? Is anti-hunger work a part of your farm’s mission? We’d love to hear your story!